Atlanta Hawks big man John Collins (208-PF-97, college: Wake Forest) (aka John the Baptist) will participate in the NBA's slam dunk contest during All-Star weekend per a report by Oliver Maroney. While this is long overdue, we're glad that JC will be able to showcase his truly unreal hops among the league's best players during the break. Collins will be the first member of the Atlanta Hawks to participate in the dunk contest since the early days of J-Smoove's (Josh Smith) heyday in Atlanta of 2004-06. Utah Jazz small forward Royce O'Neale (198-SF-93, college: Baylor)< recorded 16 points with 11 rebounds, five assists, a steal and a blocked shot over 36 minutes in Friday's 115-99 victory against the Cleveland Cavaliers. He was a very efficient 6-for-8 from the field, including an impressive 4-for-5 from behind the three-point line. O'Neale is averaging 10.2 points, 9.0 rebounds and 2.6 assists since moving into the starting lineup five games ago, and Friday's game marked his first double-double of the season. Desi Rodriguez (198-F-96, college: Seton Hall) and the Agua Caliente Clippers of Ontario (13-13) were defeated by the Stockton Kings (16-10), 119-103, on Saturday night. The Kings pulled away in the third quarter, scoring 32 points on 50 percent shooting and holding Agua Caliente to 15 points. They were fueled by a 22-10 run to start the fourth and never looked back. Rodriguez had 15 points, five assists and four rebounds. Agua Caliente remains at home on Tuesday as they host the South Bay Lakers in the third game of a six game homestand. 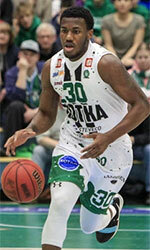 BULGARIA -- Yambol attracted the Center LaRon Smith (204-F-93, college: Auburn) on the 11th. Smith started the season in Cyprus Championship with Eta and played in 11 games. He averaged 7.4 points and 5.7 rebounds. In his first game with Yambo, the Virgin Islands national team center had 16 points and 13 rebounds in a tough loss to Cherno More, 86-82. He followed up that effort with ten points, seven rebounds and four blocks in a loss to Balkan, 87-68. United Kingdom - Justin Gray (198-F-95, college: Texas Tech) led all scorers with 25 points with an extremely efficient 75% accuracy from the floor, but Bristol Flyers fell to Manchester Giants, 79-69, on Sunday in British Basketball League. Gray continued to hit from long range, keeping the score close throughout the third period. A Granic foul sent Gray to the line and Coach Danny Byrne picked up a technical foul. Gray converted two out of three free throws and hit another huge three to put Flyers ahead 55-59 heading into the final quarter. From there onwards, Flyers offence dried up completely and Giants put together a devastating 15-0 run to claim the win. Gray nailed a triple to give Bristol a win over Sheffield Sharks, 62-61, on Friday. The Virgin Islands national team guard completed the game with ten points. UKRAINE-Deon Edwin flirted with a triple double, but it was not enough as Khmik (Chemist) fell to Kiev Basket, 79-72, Sunday in Superleague. Edwin had 14 points, 10 rebounds, 7 assists, and 2 block shots. 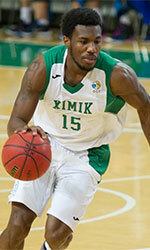 Khimik and Kiev played even basketball for three quarters then a quick 6-0 spurt put Khimik ahead. But, the team allowed Kiev to respond with 14-0 run that was the difference. LEBANON- Walter Hodge (183-PG-86, college: Florida) is usually the smallest guy on the basketball court. However, his heart is huge and pushed the defending champions Homentemen (7-2) by Byblos, 103-95, Monday evening in LBL action. Hodge had 29 points and 10 assists in 29 minutes of action. Hodge came in the game with four minutes left and Homentemen up eight. Hodge either assisted or scored the rest of the way. His basket pushed the lead to 12, 96-84. Byblos didn't give up and kept working and got within eight. Then Hodge's free throw skills shined as he hit 3-of-3 to put the game out of reach. MEXICO - Jamaal Samuel loves the Spanish countries, so far he has played in Dominican Republic, Venezuela and now Mexico. The 6-9 forward has played in several games for the Tampico Hurricanes (6-24) of the LNPB. Hurricanes managed to secure a 7-point victory over Soles, 108-101, on Saturday. Samuel was his usual self with 22 points, 8 rebounds and two assists. Hurricanes will meet at home league's leader Fuerza Regia in the next round. TURKEY -- Frank Elegar and Tofas (9-5) are on a two week break and will return to BSL action on Jan. 26th when they face Pinar Karsiy (6-8). Boone upset nationally ranked Oak Ridge, 20-16. Boone didn't take the lead until Shukiou Sprauve, of St. John, made a basket with 6 minutes, 30 seconds to go in the game, giving his team a 5-4 edge. Matthew Sokol made a backdoor layup and Sprauve made another basket to finish a 9-0 run that stretched from the end of the third quarter into the fourth. The teams engaged in a free-throw shooting contest down the stretch. The Pioneers made 8-of-12 from the line in the fourth quarter, but missed a number of short shots. Amir Nesbitt poured in 29 points to lead Virginia Academy ver Wesley Christian (KY), 79-72 on Saturday in the MLK Stand Against Violence Weekend Showcase at Woodland Hills. With the second round of District 12-6A play underway, J'wan Roberts and Shoemaker (24-5) sits alone at the top of the standings with a 9-1 record after taking a 64-42 win over Killeen (10-15, 3-6 12-6A) on Friday night. The 18th-ranked Wolves' only loss in league play was against Ellison, 70-60, on Dec. 14. On Tuesday, Shoemaker will have the chance to redeem itself at home against the Eagles. Shoemaker took off on a 10-1 run in the first five minutes, forcing the Roos to use two early timeouts in order to regroup. The Wolves added another eight points on the board and held Killeen to just three free throws at the end of the first quarter. Jonathan Kelly and the Keene High boys' basketball team are off to a fast start, 5-1 start; its toughest test of the season is just a couple of days and a long road trip away. Kelly, a sophomore guard, had 11 points in a win over Bishop Guertin, 57-46. BG went up 15-8 in the first quarter, then rode a 13-2 run early in the second to a 28-10 advantage. But Keene chipped away at the deficit, cutting it to 28-22 at halftime. It edged past the Cardinals, 39-38, at the end of third quarter before finishing things in the fourth. Chick-fil-A Classic: Champaign Central 55, Normandy (Mo.) 44. Central pulled away in the fourth quarter in the consolation semifinal game, outscoring Normandy 20-14 in the final 8 minutes to secure the 11-point victory. Sophomore Khailieo Terry led the Maroons (9-8) with 15 points, seven rebounds and two steals. Central will play in the consolation championship game at 1:30 p.m. Saturday. Poinciana 67, Liberty 59: Buzz: Jahsean Corbett had 22 points for the Eagles (9-7).